The words self-improvement can mean many different things to many different people. As we head into a new year (it’s 2017, can you believe it?! ), it might be a word that’s at the front of your mind. At the end of last year, it was a word that was at the front of our minds at TINT. Why? Because who doesn’t want to be the best version of themselves? Instead of trying to improve ourselves individually, though, we joined forces to collectively become better people – and we raised $3,000 for Charity: Water in the process. So how did TINT do it? Teammate Brett came up with the idea of the self-improvement tag and began by trying to come up with a way to encourage people to get themselves to the gym. And, after two extremely successful months in terms of participation and goal completion, decided to ramp things up. He still wanted to maintain the mission of motivating self-improvement amongst colleagues, but committed to trying a new tactic. 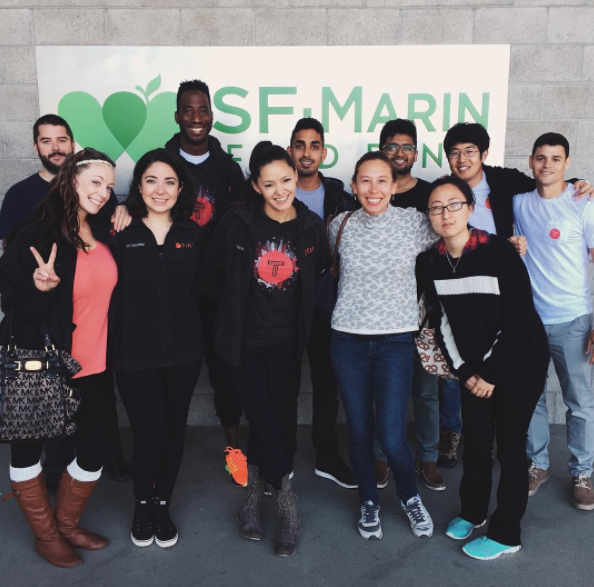 In 2014, Brett decided to encourage the team to do a different thing each month to work towards improving themselves, whether it was a fitness activity or something else entirely. The program didn’t fully kick off until July 2014, when it started with good intentions, but soon became more and more difficult to uphold as schedules clashed and people struggled to find the time to do their bit. At its core, the program was successful, but it needed a kick in the right direction. Brett considered how they could get interest stirring again and, bringing colleague Daniel onboard, came up with the idea of doing it for charity to give people that extra push in the right direction. Cue the Water Challenge (not it’s official name, according to Daniel and Brett, but a name that stuck after the challenge took hold). 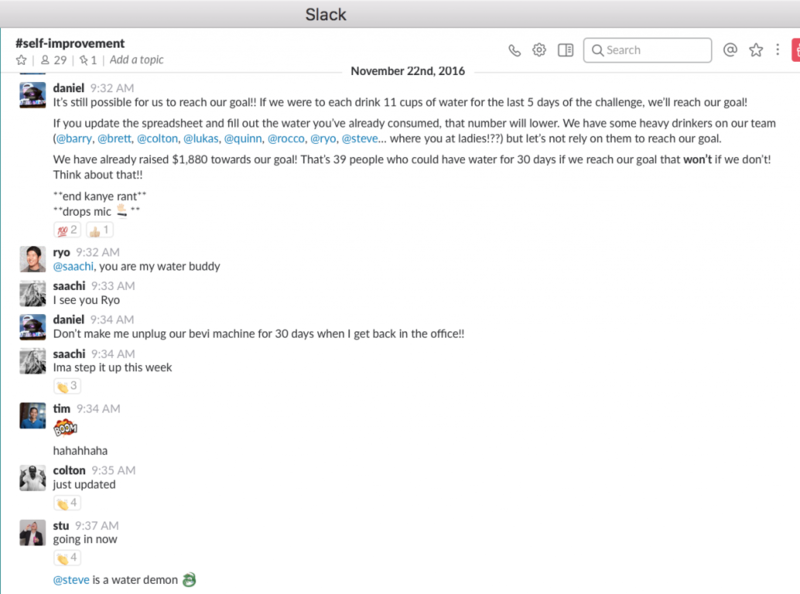 The original goal was to raise money for Charity Water by getting the entire team to drink 300 gallons of water in 30 days. This meant individuals had specific targets every day and had to blast through bottles and bottles of water every week to stay on track. The problem? People weren’t drinking enough water. Cue the next stage of the Water Challenge. In order to motivate the whole team to get involved, Daniel came up with the idea of people competing against each other – because there’s nothing like a bit of healthy competition to kick you into action, right? Everyone was still working towards the same goal – to drink 300 gallons of water in order to raise $3,000 for Charity Water – but the challenge evolved into something much more than simply downing enough bottles of water every day. Carrying out a challenge of this scale isn’t an easy task, but the team managed to get organized and figure out a way to make it work for everyone. 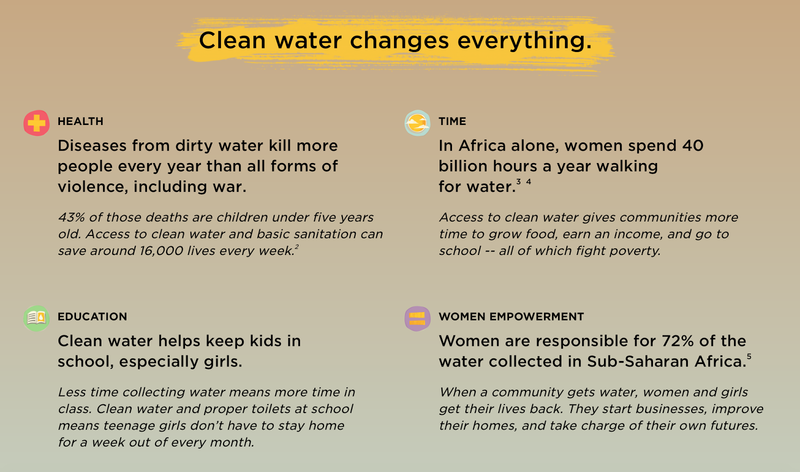 To begin with, the water challenge was simply for individuals. There was a Google sheet to track everyone’s contribution as well as the team’s progress, but Brett and Daniel wanted to make more of a team effort out of it. So, in light of this, the team set up a dedicated Slack channel and social media channels to share progress. They used the hashtags #NovemberSI and #tintup to document the process and share their results with people outside of the TINT team. Through these channels, they shared selfies of people drinking water, jokes, and encouraging words to keep the momentum going. Of course, some people were more into it than others, but the amount of people who were really into it more than made up for those who weren’t so much. While the communication encouraged people to continue drinking water and continue working towards their shared goal, it soon became obvious that people weren’t hitting their targets. In order to overcome this, the team set up creative activities that were incorporated into the working day to ensure people were constantly drinking water and staying involved. 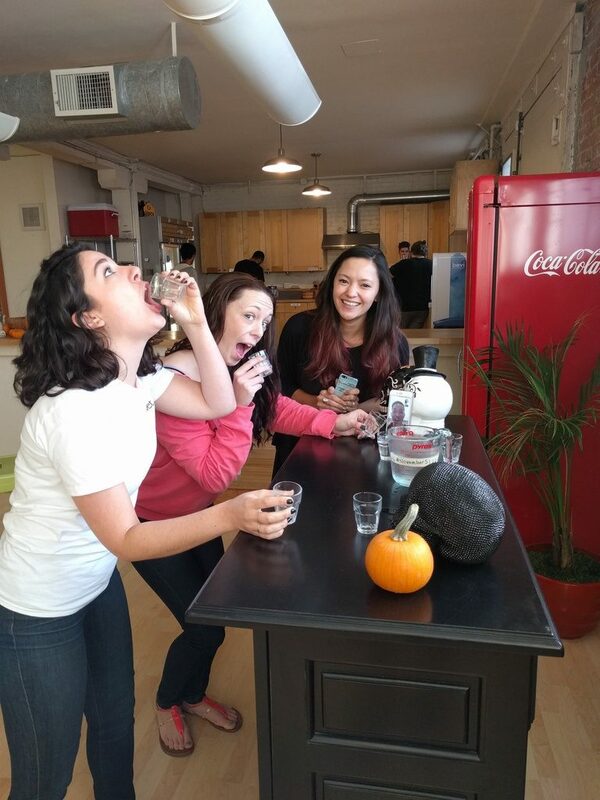 In one activity, the team posted pictures of water around the office to jolt people’s memories and handed out water cups to keep people on top of the game. In a last ditch attempt to hit that 300 gallon goal, a bar with water shots was set up where people had to down shots of water throughout the day. Daniel also introduced icing to the proceedings. 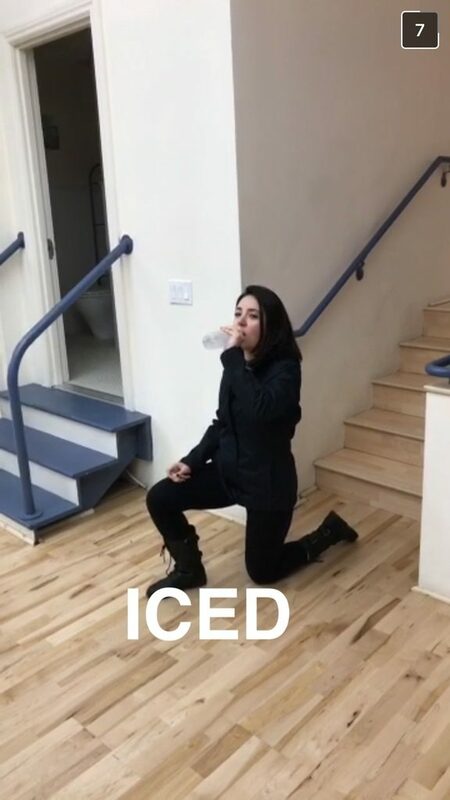 Usually carried out by college students with a large supply of Smirnoff Ice, icing is where bottles are hidden and, if you find one, you have to get down on one knee and drink the entire thing. Though these activities all helped keep momentum going, Daniel and Brett knew that they’d have to keep on top of everyone and continuously come up with new activities and new motivating methods to get to their goal. So, What Worked and What Didn’t? Daniel and Brett both noted that successful self-improvement tasks in the past have included a healthy dose of competition. With the Water Challenge, they wanted to create a competition where the team were working towards the same goal but had a certain amount of motivation to do it. 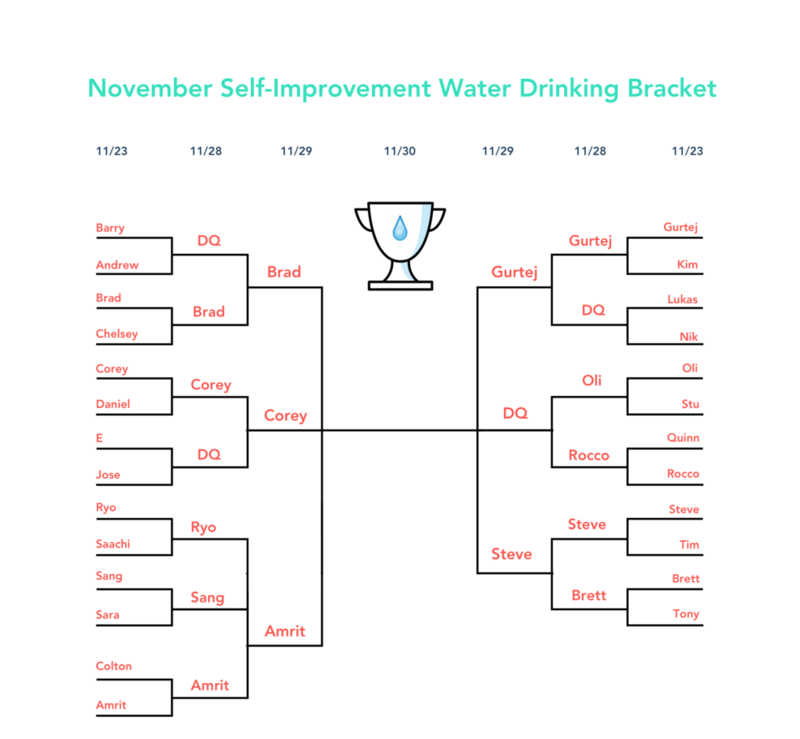 To highlight the sense of competition, they introduced a kind of “March Madness” (despite it being November), where eight people competed on each side each day to see who would be crowned the water drinking champion. The goal? Eight cups of water a day. 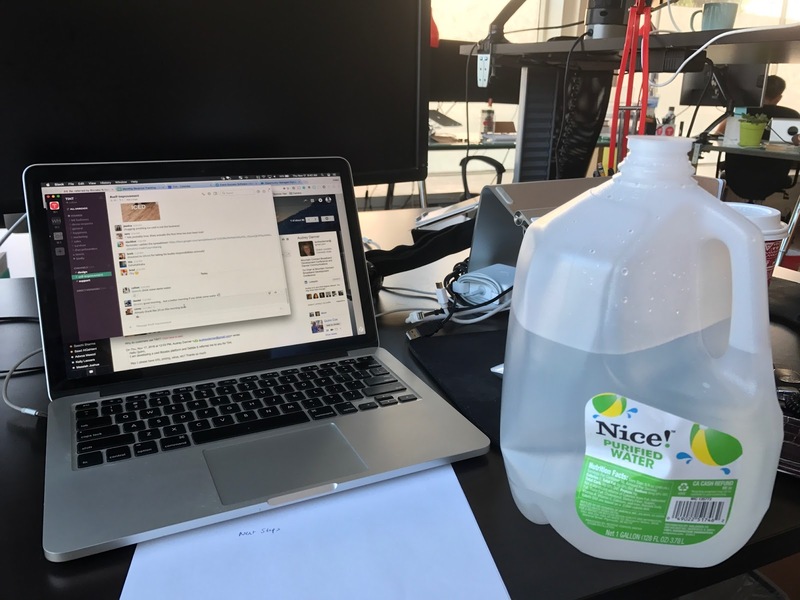 The competition became so fierce that, on the last day, Steve, one of our account executives, drank 40 eight ounce cups of water in order to win. The math was simple: 30 people, 30 days. Half a gallon of water per person a day. But somehow we managed to get our math wrong. We only had 28 employees contributing towards this goal, so we lowered our target to 280 gallons. This meant we reached our goal and donated the full amount to Charity: Water! If you’re thinking about running a charity challenge amongst your team, there are a few things Daniel and Brett say you should bear in mind. First of all, prepare to spend a lot of time organizing the challenge. The TINT team began brainstorming a couple of weeks before the start of the challenge and started advertising it when self-improvement month launched in October. It’s important to talk about it (a LOT) right from the beginning and be hands on with the process as it unfolds. You want to be messaging people, checking in throughout the day, and keeping people accountable to their goals – remember, not only are you working towards self-improvement for your team, but you’re raising money for a good cause. Most importantly, though, you need to try and find a way to incorporate the challenge into day to day life.